Were can i find the 1.1 version of Blakes 7 ? In the download page. The version has been updated in the zip file. EDIT: episode 1 finished, all went fine! But of course, I played faster than the 1st time, and didn't try every action on every situation. Well, atually, trying to play... I started to play on PC + Euphoric then I decided continue with the real thing. That said, this is a great game that pushes far, far beyond the limits of our beloved orics ! Many many thanks to you Chema ! About the protection thing... I am not sure what you mean. The dsk seems to be unprotected for cumulus, as it does not show the P at one side (that status is changed using one of the buttons at the right, I think the on in the middle). So either the SD card is protected, which can't be or you wouldn't be able to copy the image file, or the file itself is protected. If it is the latter, use your OS to unprotect it, in Windows, that means right click and unmake read only if it is marked. Dom, l'article du mag d'avril 2014 reprend le mode d'emploi du cumulus. @ Chema: thanks Chema, it seems that all the directories of the SD card were read-only. I modified this under windows. As I did both I do not know what actually blocked automatic backup. But it does'nt matter, the fact is that now it works! Thanks Dom! And congratulations for finishing the game ! Could you try the final 1.1 version? I replayed version 1.1 directly from the episode 1 beginning until the end of episode three with the same or even more pleasure. I will also play a third time, in order to write down, for posterity, all the actions that must be done, when and where they must be done to win. 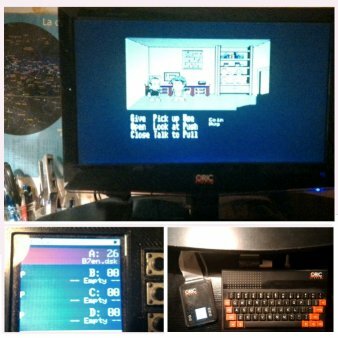 Thus, Blake 7 will join my "little encyclopedia" of Oric adventure games solutions. I'm updating the first post regularly with all the links and references I find. Yeah, that is why I posted those two here... Maybe better if I send you a message?